Storytelling has often been described as the most human of art forms. Far more powerful than data or facts, stories capture our imagination, inspire action and promote understanding. Telling one’s own story is arguably the most effective way to share information about who we are, what are the experiences that have shaped us, what matters most to us. Stories promote listening; they help us understand one another and break down barriers among different peoples. Since ancient times, Canada’s indigenous peoples have gathered together in circles to tell their stories. 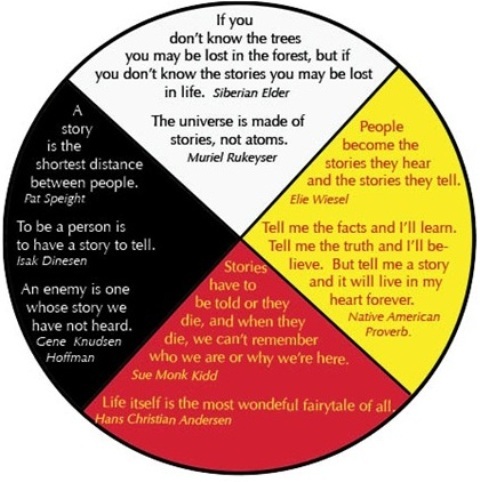 According to First Nations facilitator Jim Adams, “The circle is the starting place of all communication.” The circle embodies indigenous life values and the teaching values of First Nations, Métis and Inuit (FNMI) communities. Books of Life is an educational voyage that harnesses the language of the circle and the power of the story. Careful planning at the front end of your Books of Life project will lead you to a successful endpoint. Here are some things to get you started on the right path. Begin by considering all of the curriculum outcomes that you will cover in the course of creating books of life with your students. Depending on the grade and subject you are teaching, these may include a wide range and number of curriculum expectations. An excellent staring point is the Aboriginal Education Policy Framework and the Teachers’ Tool Kit created by the Aboriginal Education Office. The Toolkit provides excellent ideas and practical teaching strategies for bringing Aboriginal perspectives into elementary and secondary classrooms. Regardless of the form your books of life end up taking or the topics and themes they cover, you will want to start your students off on the road to creating their stories by exposing them to the power of stories and storytelling. You can do this through an introductory unit on stories, focussed on FNMI myths and legends. If possible, you may want to invite local storytellers into your classroom to help inspire your students. While creating stories and creative expressions about themselves will be a worthwhile activity for your students, the real power of Books of Life lies in finding partner classrooms with whom your students can exchange their stories. Seeking out partners in the early stages of your project is essential. Your project partners may include other teachers in your own school, teachers in another school in your board, or teachers in another board altogether. Local Aboriginal organizations, friendship centers and elders from a nearby reserve can also be invaluable partners. Seek out the Native Studies Lead, Aboriginal Advisor, or Aboriginal Program Co-ordinator in your board for assistance in finding these and other partners. Make sure your principal is on board from the outset and that he/she is well aware of the project you are about to undertake. As soon as possible, write to the parents and guardians of your students to tell them about the project, to seek their permission for any field trips you are planning, and to clear usage of any photos or videos of the students you will be taking. Find out your school’s or board’s protocol for getting permission for these activities and follow it. What will your students create stories about? Regardless of whether your students will come together to create a single class book, work in small groups or work individually, you will want to decide on a theme that ties the project together. You may want to discuss some options with your students before coming to a final decision. Here again, the grade, subject and curriculum expectations you are hoping to cover will have an impact on the choices you make. Below are some examples of themes that have worked well for teachers involved in Books of Life to date. Usually done with younger students, alphabet books allow you to focus on multiple items or issues of importance to the students in their lives and communities. Watch out, as the Q, X, Y and Z pages can be a little challenging! Books that explore the origins of each student’s name provide an excellent opportunity for children and teens to talk about their backgrounds and family values. Some teachers have combined name books with asking students to choose an animal they think most closely represents their personalities. Taking a field trip into the community and mapping out key points of interest, researching the history of your city or town, and asking students to identify what makes their neighbourhood special/meaningful are all great ways of creating stories about community. Neighbourhood walks allow you to focus on many interesting aspects of local life, including architecture, heritage, culture and social history. For a good example of how to do such walks, see Jane’s Walk in Toronto. It goes without saying that examining cultural celebrations and the food we eat provides insight into our lives. In terms of exploring the food we eat, cookbooks are a fun and engaging activity and provide a good forum for celebrating who we are, what we love and where we come from. Remember that your goal is to give students the tools they need to represent themselves in a creative and meaningful way. As such, there is no limit to the topics you can explore with them. It is up to you and your students to decide on the format of the books that you will create. Your books of life can be printed or digital, expository or creative, subject-specific or cross-curricular. Here are a few ideas. Your book may be more rustic and in appearance, hand written, hand illustrated and hand bound with natural materials such as bark, grasses and feathers. Alternatively, you may want to produce a digitally laid out and commercially printed book. Publishing a printed book has never been easier! Companies such as Apple, Blurb, MyPublisher and even local camera stores and large supermarkets commonly provide templates for page layout and high quality book printing options, all at a fairly reasonable price. Instead of printing your students’ stories, you may choose instead to create digital stories for viewing on computer. Software that ships free with most computers these days allows you to combine images, videos and music together to create digital stories. On the Macintosh, iMovie and on the PC, MovieMaker are both good starting points for pulling together digital stories. Collages, scrapbooks, comic strips, videos, paintings, dramatic performances and musical compositions can all tell stories about who we are and what is important to us. Don’t be afraid to use a less narrow definition of what constitutes a book, as you create your Books of Life project with your students. If you have been able to partner with another class for your Books of Life project, you will want to explore different ways of setting up interactions between your students and those in the partner class. Sending and receiving letters through the post is something many students today may never have experienced before. Other more modern exchange formats such as emailing and Skype calls are also an excellent way of bringing classes that may be separated by great distances closer together. It may even be possible to find a mid-way meeting point, such as a zoo or museum, and facilitate a face-to-face meeting of your students as part of a regularly scheduled field trip. Creating books of life will be a meaningful process for your students, and certainly one that they and you will want to celebrate. A book launch is an excellent way to celebrate the accomplishments of your students and to provide them a memorable opportunity to publicly give voice to their narratives. Several Books of Life teachers have invited parents, guardians, and key members of their community – including local leaders, MPs and even the town mayor – to be part of their final celebrations. Your local or school newspaper may be interested in covering the event and interviewing your students. For an example of successful book launches, see Tom Doherty’s Books of Life Celebration. You can download this guide as a pdf here.